Long days. Warmer climes. Cool nights. There’s already a lot to love about summer – and we’re about to make it even better. Full of passion mixed with Cuban flair, it’s the perfect refreshment when the heat’s turned up… Our new Summer Escapes specials menu – guaranteed to take you on a journey to Cuba’s tropical heartland, no plane ticket required. And speaking of journeys, we’re taking you on an exploration of the sun-kissed flavours you can expect from this menu. So we guess the only question is… Are you ready to escape? 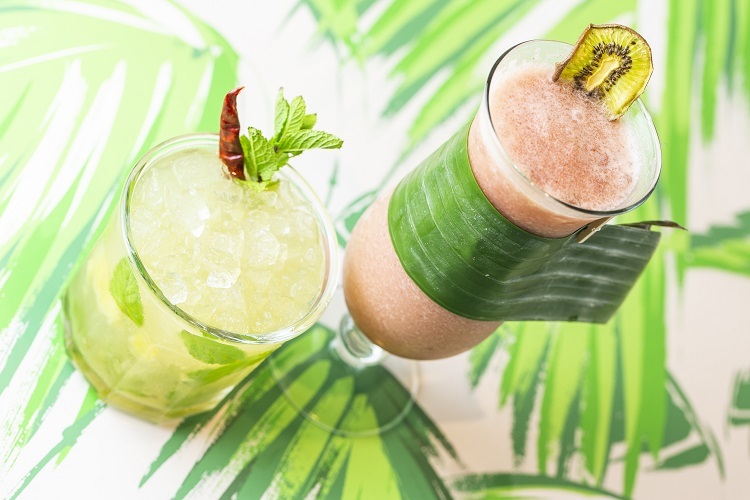 Our delicious Spicy Pineapple Mojito (left) and our Strawberry & Kiwi Colada. While nothing beats the heat quite like an ice-cold cocktail, we think even the classics need a bit of a shake up from time to time. That’s why we’ve taken two of our favourite rum-filled cocktails and given them both an original, tropical twist that’s perfect for summer sipping. For our fiery take on the Mojito, we’ve combined Havana Club Especial rum, pineapple, lime, sugar and mint, then added some heat to our Spicy Pineapple Mojito by throwing in some red chillies. And if you like it really hot – you can even order a heat from 1, 2 or 3 to create your perfect level of refreshing spice. While for our own fruity spin on the Piña Colada – our Strawberry & Kiwi Colada – we’ve taken Havana Club Especial rum again, shaken it with the coconut and pineapple you expect from a Colada, then added melon liqueur, strawberry and kiwi to create a blend that’s super-sweet and simply superb. 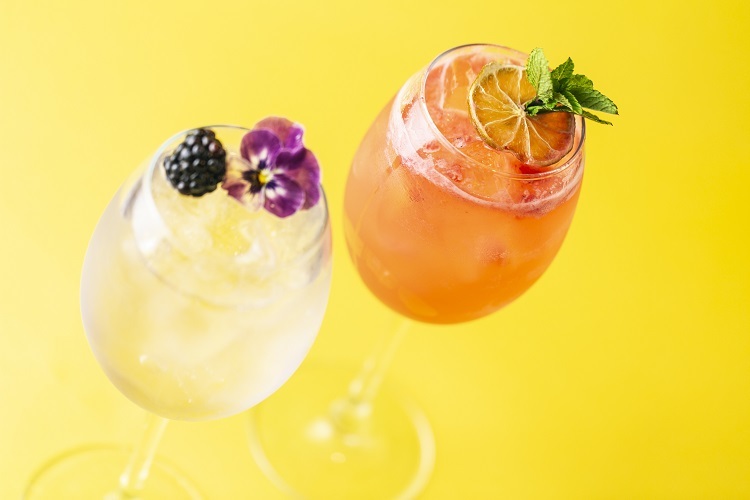 Our tropical Hoxton G&Tiki (left) with our Spanish-inspired Sevilla Orange G&T. The perfect double act to any sunny afternoon. When it comes to taste, our newest G&Ts couldn’t be more different – but these mixes are both refreshing, flavoursome, and fabulous at leaving a first impression. For instance, we’re taking you on a trip to sun-soaked Spanish orange groves with our Seville Orange G&T. Tanqueray Flor de Sevilla combined with Fever-Tree Aromatic tonic water, garnished with orange and grapefruit, this G&T has a distinctive sweetness… And the kind of immersive taste that means you’ll never want to put it down. Ever. And then we have our tiki twist on a classic, our Hoxton G&Tiki. 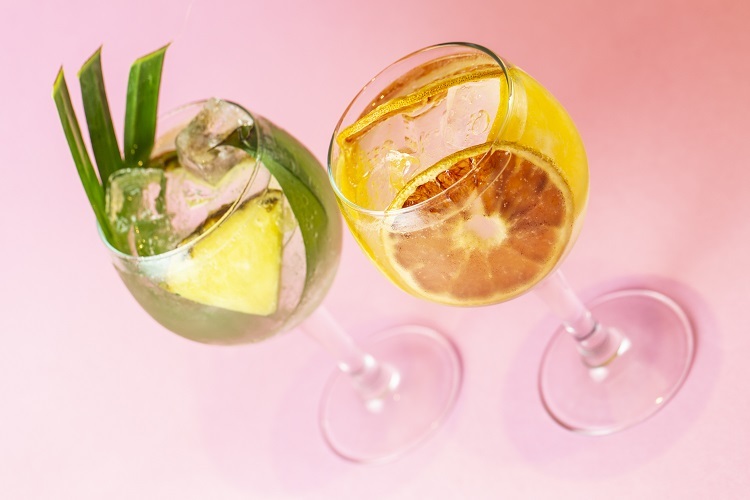 Using the tropical notes of grapefruit and coconut naturally infused into every bottle of Hoxton gin, we’ve stirred in pineapple to really complement those flavours. The end result? A gorgeous G&T that’s Caribbean-inspired and perfectly balanced, every single time. Our delicate Violet Spritz (left) next to our refreshing Rhubarb Spritz. For a feel-good hit of summer right when you need it most, look no further than these two delicate spritzers. Start with our Violet Spritz, a lightly fragrant and wonderfully refreshing mix of Freixenet Prosecco, sweet violet and lemonade. And then for dessert? Get stuck into our brand new Rhubarb Spritz. With the sweet, unforgettable flavour of Slingsby Rhubarb gin combined with St-Germain elderflower liqueur and apple, lemon, raspberry and soda, this is a spritz packed to the brim with classic British flavours. And it just so happens to taste like liquid sunshine. Of course you are. Dive into our new cocktails and experience your first taste of sun-kissed flavours by booking your table right this second. You’ll thank us later.